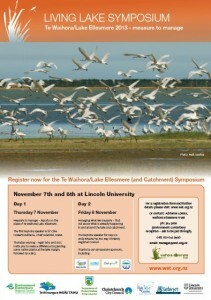 The 2013 Living Lake Symposium was held at Lincoln University on November 7 & 8. Thanks to all the presenters and to everyone who attended for making another successful and thought provoking event. The programme, with a brief outline of each presentation, can be downloaded here. Day 1 covered the state of the lake and environs and a full report, which was released at the symposium, can be downloaded from our State of the Lake project page. Attendees were welcomed by Te Taumutu Runanga and Craig Pauling. Craig’s address can be read here. Thanks to Jacqui Dean (MP for Waitaki) who also added words of welcome, standing in for the Hon. Amy Adams who was unable to make it on the day. Day 1 was chaired by Jenny Webster-Brown of the Waterways Centre for Freshwater Research. The presentations are below. Day 2 – Managing what we measure…..
Our keynote speaker, Andy Bruere, gave us an insight into how issues are being addressed elsewhere and then we looked at the range of initiatives and research underway in the Te Waihora catchment. Day 2 was chaired by Ian (Whit) Whitehouse, Environment Canterbury. The presentations are below. Thanks to Kelvin Coe, Mayor of Selwyn District and Donald Couch, Environment Canterbury Commissioners, for their final words, and to Te Taumutu Runanga for bringing the symposium to a close.